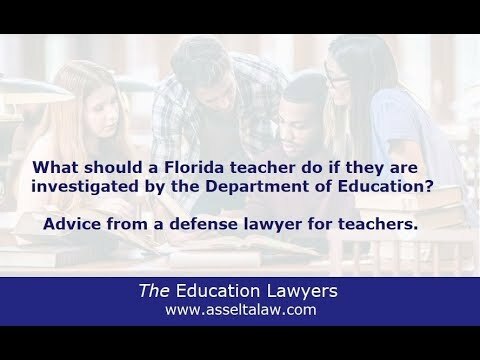 What should a Florida teacher do if they face an investigation by the DOE? What happens if a Florida teacher receives a letter from the Department of Education? If you received a letter from the DOE, chances are you have some idea what it is about. Most of the incidents originate at your district level. You may have been investigated by your school district and even faced disciplinary action. However, districts are required to report certain infractions to the state. Even though you may have settled the incident with your district, you may still face additional discipline from the state. What should a teacher do if the receive the DOE investigation letter? Call an defense attorney for teachers immediately. The DOE letter will request documents, statements, and more and want it all in a very short time frame. What the DOE does not tell you is that you can hire a lawyer to defend you. This is your livelihood and your profession. Do not take a letter of investigation lightly. The sooner you get an attorney who defends teachers involved, the better your chance at a successful outcome.